If you missed it live, here is Cornell’s titan arum blooming over 40 hours March 18-19 compressed into 100 seconds, plus the spadix collapsing three days later. More on titan arum at the Titan arum blog. Broccoli has gotten a bad rap (again) in this week’s Supreme Court debate of the constitutionality of the Affordable Care Act. But in this Marketplace radio report from American Public Media, Thomas Bjorkman stands up for the much-maligned vegetable. Broccoli was mentioned eight times in oral arguments and Justice Scalia framed what’s become known as The Broccoli Question: If the government can make everyone enter this health insurance market, why not the food market? Can the government also make you buy broccoli? Kermit Roosevelt: If the government tried to make you buy broccoli and eat it, I think there would be a constitutional problem with that. But that’s not what the individual mandate does, he says. Making people buy a policy isn’t saying they have to go to the doctor. And grocers don’t write off the cost of giving away billions of dollars of free broccoli and then jack up food prices for the rest of us. Roosevelt: We don’t have the broccoli emergency rooms where people say they don’t want broccoli and then they go and get it and make taxpayers foot the bill. But don’t mention any broccoli emergencies to this guy. Thomas Bjorkman: I feel protective of it! Thomas Bjorkman is director of the Eastern Broccoli Project at Cornell University and has devoted the last 20 years — most of his career — to studying this particular vegetable. Bjorkman: I’ve gotten used to watching it grow, its like you’re used to watching your pet behave in certain ways, I’m used to seeing the broccoli behave in certain ways!! If he’s learned one thing about broccoli its this: Most kids love it. It’s the best-selling green vegetable. When Bush said he hated it, broccoli sales shot up the next year. Which makes you realize, whatever the Supreme Court decides about health care? Could be a great year for broccoli. 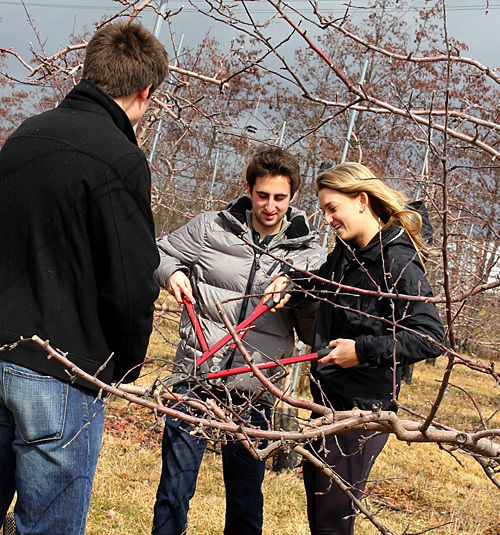 … or taking a trip to Cornell orchards to learn how to prune apple trees. Fine weather to put the apple pruning lesson into practice. 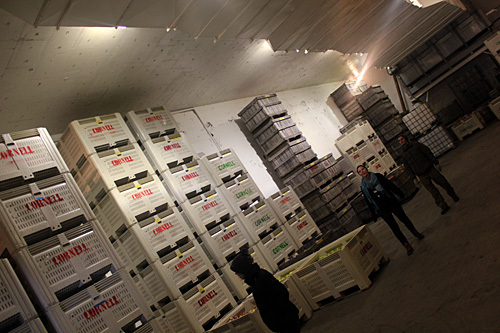 … and storage at the Cornell Orchards farm store. 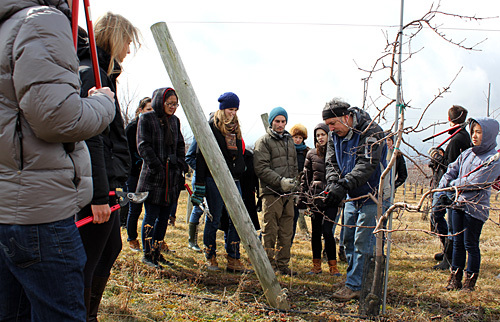 VitisGen (the Specialty Crop Research Initiative project to apply molecular technology to grape breeding programs) will host a meeting of all Project Directors along with its Industry Advisory Committee here in Geneva, April 16-17. A workshop in genetic mapping technology known as “Genotyping-by-Sequencing” will be hosted in Jordan Hall on the afternoon of April 17 to carry out the mission of VitisGen to educate breeders and all interested parties in this new and very powerful technique. 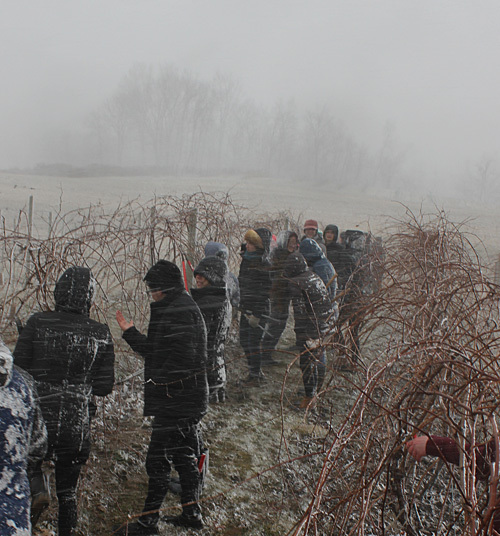 Frosty night threatens early-budding fruit crops [Associate Press 3/27/2012] – “This is absolutely the earliest we’ve seen,” Cornell University horticulture professor Susan Brown (right) said of the combination of freezing weather and plants that have come alive early. Most threatened overnight are apricots, which are already in full bloom. “They’re going to be toast,” she said. Berry growers cautioned about new insect pest [Cornell Chronicle 3/27/2012] – An Asian native, Drosophila suzukii first appeared in California in 2008 and subsequently became established in the Southeast. Hurricane Irene is credited with helping it expand northward last year to the Hudson Valley, Finger Lakes and Long Island. If you’re planning what annual flowers to grow in your garden or containers this season, check out the 2011 gallery at the Bluegrass Lane Annual Flower Trials website. Last year was the eighth season of testing new and soon-to-be-released varieties. This information is used by the industry to develop better plants for consumers. Better plants mean happier customers, and potentially more sales. The research is led by Bill Miller, with trial garden coordinator Melissa Kitchen and crew of summer interns. They evaluated 225 varieties from seven companies in 2011. New last year were trials of more than 20 combos — mixtures of plants developed by breeding companies to help take the guesswork out of deciding which flowers make beautiful combinations for gardens and containers. These combos help instill confidence by pre-selecting two or three varieties that work well together, giving a blended look. They have similar growing requirements and may feature complementary colors or themes. Examples include: hot colors featuring reds, oranges and yellows; nautical themes of blues; or the patriotic red, white and blue. This is a hugely popular trend, with each breeding company having their own line of designer combinations. 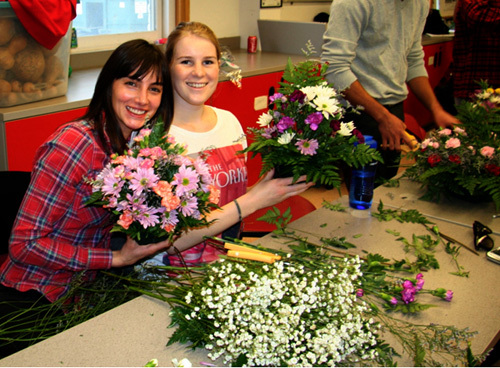 Visit the Annual Flower Trials website. 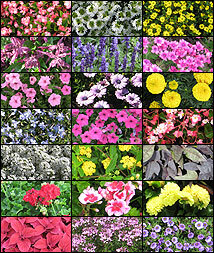 View top-rated plants from 2011 trials. If you missed Johannes Lehmann’s presentation March 12 on Integrated biochar systems for soil fertility management, it’s available online. Michelle Shearer, 2011 National Teacher of the Year, will speak on “Teaching, Learning and the Power of the Human Factor” on April 24 at 7 p.m. in 233 Plant Science Building on the Cornell University campus. While the Urbana, Md., high school chemistry teacher honed her teaching skills in STEM courses (science, technology, engineering and math), the lessons she shares inspire educators of all students, regardless of their age or gifts. Shearer, who holds dual certification in chemistry and special education, believes there is an aspiring scientist in all students. 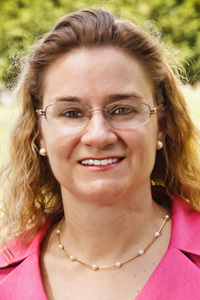 She makes a concerted effort to reach out to students who have traditionally been underrepresented in scientific fields, including students with disabilities, minorities, and young women. “Although chemistry can be an ‘intimidating’ subject that is often viewed as difficult for students to grasp, I have always embraced this simple idea: Chemistry is everywhere, and thus chemistry is for everyone. Everyone. Not just college-bound students, students of a particular ethnic group, or even students of a certain age,” says Shearer. “I have successfully accommodated exceptional students with low vision, dyslexia, dysgraphia, attention deficit disorder, and Asperger’s syndrome into my AP chemistry classroom,” adds Shearer, who previously taught chemistry and mathematics at the Maryland School for the Deaf. Shearer’s talk will be followed by a dessert reception. The event is sponsored by Cornell Teacher Education, Ithaca College Department of Education, Cornell Employment and Disability Institute, and Wells College Education Program. For more information, visit education.cornell.edu/toy or contact Bryan Duff: bpd38@cornell.edu or 607-255-8663. Moving Beyond the Natives/Exotics Debate [Urban Habitats March 2012] – Disturbed soils and other factors in the urban environment present challenges for well-intentioned gardeners, not to mention for the plants they wish to grow, writes Nina Bassuk (right). 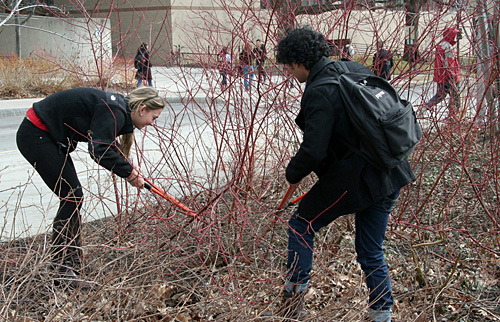 Public gardens help feed hungry, preserve biodiversity [Cornell Chronicle 3/20/2012] – Donald A. Rakow, Elizabeth Newman Wilds Director of Cornell Plantations, addressed the importance of today’s public gardens at New York City’s 92nd Street Y March 14. 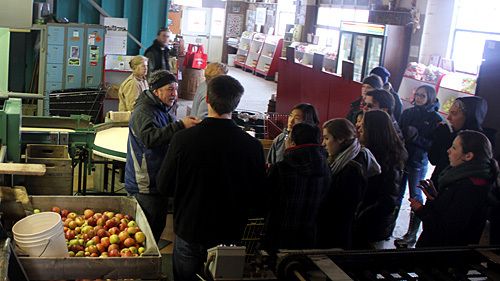 ‘Wee Stinky’ draws crowds to Cornell [Cornell Chronicle 3/21/2012] – The towering titan arum (Amorphophallus titanum) attracted about 10,000 visits, including more than 3,500 on March 19 alone. More info at Titan arum blog.